So I don't have anything to talk about today. Odd I know, as I am usually such a chatterbox. Instead I've decided to be lazy and regale you with a review from one of my old blogs. The review is for 'Metro 2033' Enjoy. As I sit here at home in the warmth of my bedroom, surrounded by speakers and convection heaters looking out the windows at the snow strewn streets I truly feel bad for the future inhabitants of Moscow's metro system. While I'm warm inside with music playing and a recent checkpoint loading up the people of Metro 2033 are stuck underground with their blankets wrapped tightly around themselves freezing to death, thanking their gods that at least it wasn't the mutants, the Soviets, the Nazis or, most terrifying of all, the Dark Ones who killed them. Travelling through the metro system the player is subject to the harsh realities that plague the post apocalypse in this linear first person survival game from 4A games in association with THQ for PC and X-box 360. 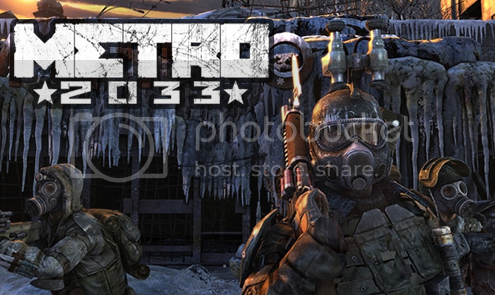 Metro 2033 is based on a book with the same name by russian author Dmitry Glukhovsky, set in a post apocalyptic Moscow where nuclear winter ravages the outside world, forcing the surviving people of the city and, perhaps, the world from venturing out further than the many train stations that have been set up as towns and cities. The game follows the story of Artyom as he attempts to locate his friend and ally, a lone soldeir named Hunter, with the goal of stopping the menacing creatures known as the Dark Ones from destroying man kind altogether. Artyom's journey is filled with twists and turns that force him through the darkest corners and under passes of Moscow's underground. The story is elaborate, creative and, though perhaps a little predictable at times thoroughly enjoyable. The world and environment that the player is thrust into are amazingly atmospheric, from the gas powered lamps and the cramped housing facilities to the cracked glass of your gas mask and the simple but effective traps and alarm systems. Other characters in the world feel believable and emote-able. Going through the levels you often have the option of fighting through crowds of enemy soldiers or sneaking past them with the (fairly generic) stealth system. Players can turn off lights and crouch through the tunnels to avoid detection, later on they can even get night vision goggles, however enemies can also use them, which means stealth isn't always a sure thing. In fact it's a little messy. You are given stealth weapons, silenced pistols, cross bows, throwing knives and the like, but a single kill with these weapons, regardless of whether anybody saw it, will render your stealth null and void. They will all be looking for you and it will take more than possible skill to avoid everyone. Fighting against mutants is far simpler. They come near you, you kill them. You aim and shoot. If they don't come near you, you shoot them. You aim a bit better and shoot. For the most part they will come near you, and if you are fighting alongside anyone its highly likely that you wont even need to aim and shoot to kill them. This is one of the rare occasions where the A.I. is too good. It doesn't happen often, but there have been occasions in Metro 2033 where I have been out of long range ammunition and relied solely on my shot gun, however my partner has been such a dead aim shot with their AK47 that I haven't had to waste a bullet. Good for my survival, bad for my statistics and gameplay experience. Overall however the A.I. doesn't take all the fun, you have plenty of time to fight off enemies alone, and if you have a rifle and ammo the A.I. wont take too many of the kills in the team up sections. Metro is a first person game which shares control similarities with Killing Floor (Next weeks review!) and Half-life. It can feel a little complicated at times, unnecessarily so. switching weapons involves scrolling to an appropriate selection and then pressing the fire button, which wastes valuable time when you're in the middle of a fight. it would be a lot smoother if the mouse scroll changed the gun automatically. The assumption is that this process allows the player not to have to change the weapon if they change their minds, however they cannot fire again until the selection pop up window vanishes once more, so the mechanic is more restricting than it is helpful. However these are an already established control system, not something new that Metro has attempted for the first time. To be honest the gameplay, besides the survival aspects, of constantly changing gas mask filters, the scarcity of ammunition, the ability to purchase guns or use your currency as bullets and the rather entertaining story it's a fairly generic game. Besides the aforementioned it doesn't do anything that another game has done before it, often better. I have little to say about the game graphically. It isn't a major aspect for me. However it does feel a little outdated, noticeably so, but not so much that the player cannot enjoy the game regardless. Otherwise I've enjoyed the game thus far. There are one or two minor bugs, that I've noticed, but otherwise it's a fairly well rounded game, a very good purchase for an FPS fan looking for a good story. So if I had to give it a score (and judging by my last couple of games blog entries it's starting to look like I do) I would give it an 8 out of 10. I have personally really enjoyed the game, however the gameplay is very generic, the graphics are 2008/2009 graphics and the A.I. ranges between annoying and impeccable. Well that was that. I hope you enjoyed it.